As a Urologist I have dedicated my life to caring for patients. 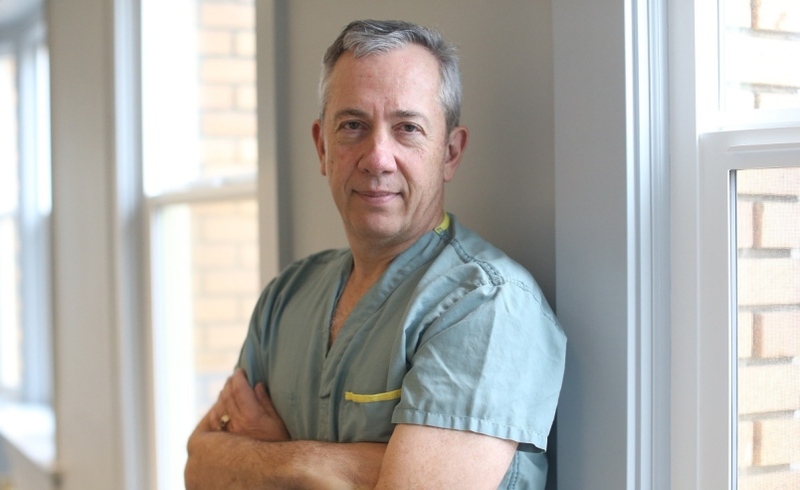 As Executive Medical Director for the Island Health Surgical Program since 2017, I lead quality patient care in both Royal Jubilee and Victoria General hospitals. This summer I found out I had brain cancer and suddenly, I was the one who needed care. When you are active and healthy, you feel as though you could live forever. After I received news that two of my friends had cancer, I started training for a 100 kilometre race in their honour. Having cycled 96 kilometres in August to prepare myself, I felt strong and proud. But the very next day, I collapsed on a golf course. I was taken to the Emergency Department at Royal Jubilee Hospital by ambulance. Suspecting a cardiac issue, they quickly ruled that out. But CT and MRI scans identified what looked like a tumour in my brain. They scheduled a brain biopsy. My surgeon, Dr. Steve Hentschel, Head of Neurosurgery, was sensitive when delivering the news to me, but direct. I was diagnosed with glioblastoma, a cancerous brain tumour that advances fast. Immediately I knew the significance and gravity of what he was telling me. I have no doubt it was hard for Steve, too: not only was I his boss, this would affect my life. Knowing the medical implications of the tumour, I wanted the most aggressive treatment possible and that was brain surgery to remove the tumour. Following my biopsy, I was booked for a three-hour surgical procedure a few weeks later. When I got into the operating room at Victoria General Hospital, everyone was so nervous. These were nurses and doctors I work with every day, my colleagues. I wanted the team to be calm, I wanted to be calm — the only way we could find calm was through humour. After a great laugh, Dr. Hentschel, Anesthesiologist Dr. Tom Ruta, and nurses, began operating on my brain. More than the average patient, I know what this team is capable of. When our care teams know what to do, where there’s a need to get it done quickly — they do just that. It was very strange to reverse the roles and be a patient in the operating room I work in every day. As a surgeon, I knew the risks: possible brain fluid and infection, vision loss, stroke, among other possible side effects. But when I woke up, there was none of that. I stayed in the hospital for only four days — I felt good. Dr. Hentschel and Dr. Ruta are very humble physicians, but truly: I am here today because of them, accurate diagnoses and skilled decision making. Everything we tell others to expect from our care, I now know with confidence it’s true. Doctors wheel in and out of rooms in five minutes, but as a patient, the nurses and the porters are your world. With respect to my experience of caregivers on the unit, I was truly blessed. A lot of what happens medically to us is silent… until it’s not. You’re cycling 96 kilometres one day with no idea there is something to cause you harm and then life changes in an instant. New technology helps us understand the problem, where it is and how we can best respond. Over the last decades, the question has shifted from “Can we do the surgery?” to “Can we do it without harming the surrounding structures?” Our goal is to perform a surgery that is less invasive and causes the least damage. That is important in neurosurgery where the brain cannot regenerate. Equipment alerts us to a problem that our care teams can remedy. That is why I am so fortunate to work with the Victoria Hospitals Foundation to ensure we have the equipment our teams need to do their best work. I have supported the work of the Foundation for many years and have been grateful to our community for their generosity to our hospitals. Now especially, I am grateful for the donors who come together to support excellent healthcare on Vancouver Island. Whether or not my health journey is over, that’s a story for my next MRI scan to tell. For now, I am down to one job: getting better. I am undergoing radiation and steroid treatment — and yes, it’s frightening. Due to side effects, I have short term memory lost and that makes you really humble because you realize how fragile life is. Cherish moments with loved ones and have these moments more often — don’t wait for a medical emergency to realize what is precious. I believe this happened to me for a reason. My story isn’t over – I have a strong desire to deliver exceptional care to Vancouver Island patients, now more than ever, and I know there is more work to be done before I retire. According to Dr. Hentschel, my collapse had nothing to do with the tumour. Something else triggered it. And if I hadn’t collapsed, if the tumour had presented a month later, it wouldn’t have been dissectible and my future would be very different. My story could be yours, and without extraordinary diagnostic and surgical equipment, I would not be here to tell it. Funding advanced equipment for our hospitals will save lives. I know this because it is technology that lets my medical team know what is going on inside their patients right now. You are vital to ensuring our teams have access to this technology! Last summer, I thought I was training for a bike ride. I had no idea I was training for the ride of my life.